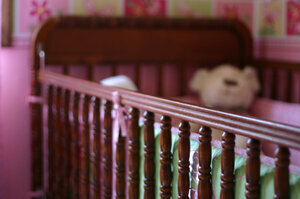 Home » Child safety » Rethinking SIDS. Posted by Geraldine Hickey RN on December 4, 2015 in Child safety, Infant and child safety, SIDS | Comments Off on Rethinking SIDS. Many cases once thought to be sudden infant death syndrome are now believed to be accidents caused by unsafe sleep practices. The image above shows a crib with a teddy bear and bumper — items the American Academy of Pediatrics warns against putting in your baby’s crib.